"My horse, Fancy That, was kicked by her 3 month old colt in the stifle, bruising the bone and damaging all of the soft tissue in the area. She couldn't move more than 10 inches at a time with her hind legs. She went from one day running around the field freely to hobbling around in agonizing pain. My vet, who was concerned about permanent lameness, recommended that I have Patti do a few treatments on Fancy, to increase the circulation to the damaged area. Patti was incredible because she not only worked magic on my horse, but she talked to me through the whole process explaining exactly what she was doing and even showing me how to work on Fancy myself between sessions. After the first session, Fancy didn't make any noticeable improvement. However, following the second and third sessions it was a night and day difference! She moved freer and seemed much more content. Also, her appetite increased and she started taking large strides again. By the end of the third session she was a new horse! When I turned her out to pasture she picked up an extended trot and went to greet the other horses. "After Patti's sessions, my vet came out to check on Fancy's progress and gave her a thumbs up! He was really surprised at how much progress Fancy had made in such a short period of time! The swelling was completely gone and she had no tenderness in the stifle area. He even said that the bruise on her bone had healed, thanks to the increased circulation to the area. He was so pleased with Patti's work! Fancy is moving without any hitch in her gate and trotting and cantering with ease! I am absolutely delighted to have my horse back!!! I cannot thank Patti enough for all she did to make Fancy's healing possible." 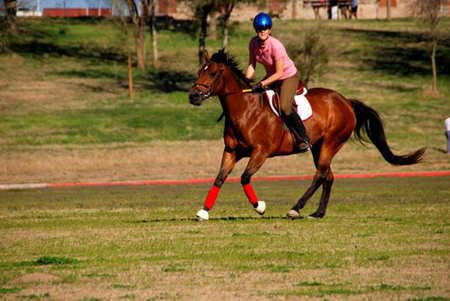 "As you know we pay close attention to how our horses feel as a whole, mentally and physically. It is the foundation of our training. To this end, the results of your work are truly amazing! Our youngsters are freer in their movement and our horses under saddle are softer and more relaxed than ever. "I wanted to let you know how much we appreciate your dedication and commitment to helping our horses to be the best they can be. You have a unique gift and we look forward to you continuing to be an integral part of the Hy Court team in the future." "I have tried many types of therapeutic treatment and maintenance for my horse, but I find this is the best. "I have seen instant and lasting results from Patti's acupressure sessions. She is so thorough and works from careful notes taken from previous appointments. "I am the owner of a 30 year old chestnut quarter horse. About three years ago he was diagnosed with high ringbone in his right front foot. "Already suffering from ringbone in his left front foot, he became lame and started to limp from the pain. I immediately put him on Adequan which relieved his pain and limping. One vet advised me to retire him fully though I knew my horse wasn't ready to stop working. I continued to hand-walk him but noticed he was subdued in spirit and lacked confidence to move his body, almost as if he feared stumbling. He also started to experience tension in his hindquarters. Then I met Patti and asked her to work on my horse in hopes that the acupressure might give my older horse a better quality of life. The results were dramatic. My horse regained his confidence to use his feet, began to move freely and was eager to go back to being ridden under saddle. For the first time since he was diagnosed with high ringbone, he was routinely sound again. His good days far outnumbered his bad days and at times, he had the energy and spirit of a 2 year old horse. My greatest surprise was that I found myself having the best rides of my life with him. I sincerely believe Patti's acupressure work gave my horse a new lease on life. I shall always be grateful to her."